When elections take place in countries transitioning from authoritarianism to democracy, from deep political crises to stability, or from war to peace, their significance is greater than usual. In such instances, elections are expected to bring legitimacy of government and contribute to consolidation of democracy, peace and stability. If, however, decisions on the timing and sequencing of transitional elections are not well- thought through, the elections can instead exacerbate tensions and thereby increase the risk of renewal of conflicts or democratic backsliding. This paper provides guidance on how to design decision-making processes so that the elections facilitate rather than undermine democratic transitions. 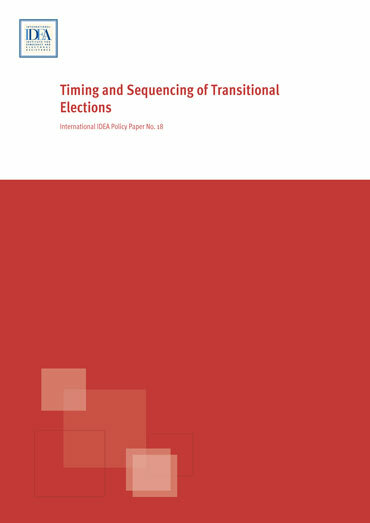 This Policy Paper draws on lessons learned from 15 case studies of transitional elections from around the world, as well as conclusions derived from three expert workshops, presenting a set of practical recommendations for those involved in decisions concerning the timing and sequencing of transitional elections. Preliminary election results of the presidential election (3 February 2019) in El Salvador. Image Credit: Supreme Electoral Tribunal of El Salvador.